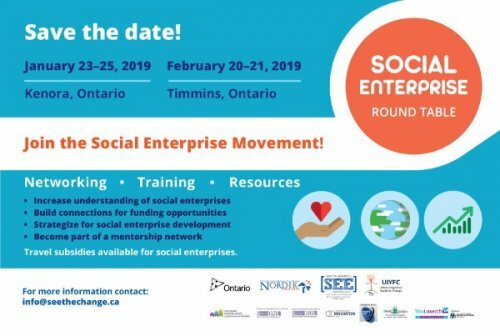 Save the date message from NORDIK Institute - [SEE] Social Enterprise and Entrepreneurship Northern Region Partnership. Calling all business developers, social enterprises and entrepreneurs! Two wonderful opportunities to build capacity in developing and scaling up social enterprises, tap into funders and training resources, and create a network of mentors. Learn about existing SEs in the region, their contributions to resilience and sustainability, ways to support their development, communicate their value, and develop a business plan. Travel subsides available for social enterprises.